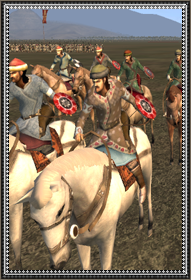 Turkic horse archers descended from the eastern Steppe. These men are armed with a recurve bow effective at close and medium ranges from the intended target, but accuracy suffers at range. The unit's lack of armour makes them especially fast, able to outrun the most persistent of pursuers ensuring that they get to fight another day.